Goodreads says, "Married to Emperor Franz Joseph, Elisabeth—fondly known as Sisi—captures the hearts of her people as their “fairy queen,” but beneath that dazzling persona lives a far more complex figure. In mid-nineteenth-century Vienna, the halls of the Hofburg Palace buzz not only with imperial waltzes and champagne but with temptations, rivals, and cutthroat intrigue. Feeling stifled by strict protocols and a turbulent marriage, Sisi grows restless. A free-spirited wanderer, she finds solace at her estate outside Budapest. There she rides her beloved horses and enjoys visits from the Hungarian statesman Count Andrássy, the man with whom she’s unwittingly fallen in love. But tragic news brings Sisi out of her fragile seclusion, forcing her to return to her capital and a world of gossip, envy, and sorrow where a dangerous fate lurks in the shadows. Through love affairs and loss, dedication and defiance, Sisi struggles against conflicting desires: to keep her family together, or to flee amid the collapse of her suffocating marriage and the gathering tumult of the First World War. In an age of crumbling monarchies, Sisi fights to assert her right to the throne beside her husband, to win the love of her people and the world, and to save an empire. But in the end, can she save herself? Featuring larger-than-life historic figures such as Bavaria’s “Mad King Ludwig” and the tragic Crown Prince Rudolf, and set against many of Europe’s grandest sites—from Germany’s storied Neuschwanstein Castle to England’s lush shires—Sisibrings to life an extraordinary woman and the romantic, volatile era over which she presided." Sisi: Empress on Her Own picks up where The Accidental Empress left off and while you don't really need to read the first book to enjoy this one, I highly recommended it if you want a full picture of Sisi's extraordinary life. At this point, Sisi is frustrated at not having truly raised her eldest daughter and son, thanks to her domineering mother-in-law, but now that she has had her youngster daughter, Valerie, she is determined to not let her out of her sight. She often takes her away from court to her various country homes so she can not only be with her alone, but also ride her beloved horses. All this time away from home has put a strain on her relationship with her eldest son, Rudolf. When her daughter Gisela writes saying that she is concerned about Rudolf's tutor, Sisi packs up and heads home to Vienna. Things are always much different at court though. There are people who gossip about her relationship with Count Andrassy as well as her time apart from her husband. While there, Sisi longs to escape on her next adventure and is torn between her duty as Empress and doing what is best for herself. As time goes by there is even more in store for Sisi and her family. Rudolf struggles as he comes into his own as the Crown Prince, her youngest daughter is ready for marriage, and then there's always her shaky relationship with the Emperor. Fans of Allison Pataki won't be disappointed by Sisi: Empress on Her Own; it's definitely a sweeping and entertaining saga about one of the most fascinating people in history. I have this love hate relationship with Sisi. On one hand, I admire that she is, essentially, a modern woman trapped in a different time. She longs to be independent and has really grown up in Sisi: Empress on Her Own. On the other hand, she spends so much time away from her two eldest children that it is sort of heartbreaking. I get that she loves her horses and the country, but she is often found escaping court for very long periods of time. This obviously impacts her children, especially Rudolf. The turn of events, especially in the second half of the novel are unbelievable. I often had to remind myself that Sisi: Empress on Her Own is based on real-life events, not from the author's imagination. She lived through many ups and downs. I knew of Sisi's fate, but it still broke my heart to see how things ended for her and her family. Nonetheless, Pataki does an excellent job incorporating historical events while still keeping readers interested and invested in Sisi's personal life. Also, the various settings in Sisi: Empress on Her Own were outstanding. I loved the gorgeous Habsburg court, the English countryside, the Irish countryside, and especially her depictions of the famous Neuschwanstein Castle. Pataki brought it all to life expertly. 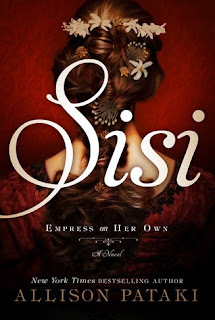 Sisi's story is a fascinating one and I highly recommend The Accidental Empress and Sisi: Empress on Her Own to those who enjoy historical fiction and stories about royals. I know I will be on the look out for Pataki's next project. Great review! I still haven't read The Accidental Empress but I do plan to read both books someday. She sounds like a fascinating person. I think you would like both books, Christina! She is definitely fascinating. Thanks for visiting! I'm super curious about her life now Christina! I can imagine it reads like a piece of fiction rather than history, as so many of the lives of royals do. Since you said you knew of her fate I'm guessing it doesn't end well, so of course now I have to know what happens! Yes, you are so right, Jenny! Haha. Don't google her! :) Thanks for dropping by! I find it odd that she seems to have a firm disposition on the importance of raising her children, but when it comes down to it, she would forsake all for the love of horses. Contradicting, to be sure. Yes, she contradicts herself left and right, but she is a fairly modern woman for sure. Her obsession with riding and her horses definitely trumped many other aspects of her life. Thanks for dropping by, Joy!